Video exists of Yogi Ferrell reflecting on a 2012 summer league matchup against “that little point guard.” That little point guard is Fred Van Vleet and he’s guided his Wichita State Shockers to a better seed in the NCAA Tournament than Yogi Ferrell’s. These guys are both in my top five of college basketball’s best point guards. Each are very similar in this way: they’re intent on orchestrating an offense but will burn a team that disrespects them in a defensive scheme. Each is small, by NBA standards, but huge on campus and in the huddle. Yogi Ferrell has greatly improved his three-point shooting over his Indiana career. Van Vleet’s three point numbers have declined, but that’s not the priority of his game. His point production ticked up a free throw this season. His assists per game remained above 5. The outcome of this matchup will come down to what happens on the perimeter. I’ll be closely watching how these competitors exchange jabs to start. Much will be made (and already is) about the front court matchups in this contest. But the most anticipated 5-12 matchup of 2015 could come down to the post. I mean, how can you converse about a game between the Mountaineers and the Bulls without some beef? Moss is weighing in at 240 lbs., Williams 255 lbs. Big 12 opponents describe Williams as the toughest guy to grab a rebound against (I listen to a lot of Kansas City sports talk radio). Moss averages 9.3 rebounds per game. Watch closely who finishes at the rim, and who commits the most fouls at the rim. In high school, these guys were voted most likely to drop 30 points in an NCAA tournament game. (If only yearbooks had meaningful popularity contests like this). Harvey single-handedly led his Eagles to a victory late against Montana in its championship game. Smith-Rivera has apparently dyed his hair orangish-red, to match the NBA-Jam like fire he can ignite with. These shooting guard’s average (Harvey 22, Smith-Rivera 16) doesn’t tell the story of how many points they can drop potentially. Every winning team claims to have a “glue guy.” Sir Dom and J.J. qualify, in fact, they’d probably tell Elmer (to his face) that he’s a chump. For San Diego State, J.J. O’Brien was the guy who came over from the opposite block to double-team Joel Embiid as the Aztecs dominated a game at Allen Fieldhouse against KU. Pointer’s creativity in transition and defensive prowess at the rim gave the Red Storm a real shot at beating Duke on Coach K’s 1K moment. I can’t say it’s a true one-on-one matchup, because these guys maybe assigned to guard everyone else. Check the box score afterwards though and give me a shout. 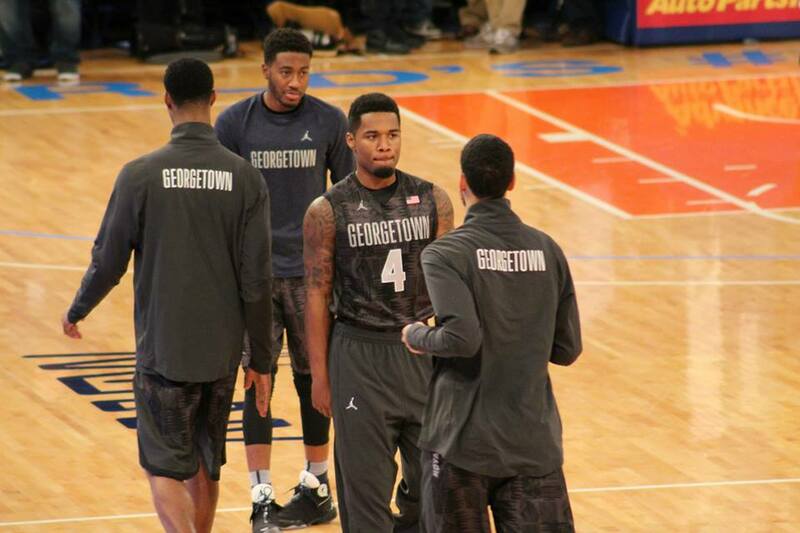 In a different life, Tuttle would have been a great point-center on Georgetown’s offense. He’s a true center who can receive the ball at the top of the key, peruse his options, then bang away at a defender to get a hoop if need be. His court vision is incredible. These two versatile centers will go at it. Both can run the break. Each can start and finish a play. Nance Jr. has really come on since a knee injury that cost him a previous season and a more recent battle with mononucleosis. Each of these teams would be a surprise to make an Elite 8, but I can see this being a catapult game. After a hard-fought contest, the winner can be propelled with a huge wave of momentum. Each school is not a traditional power, or even a frequent guest of this prestigious tournament. They’re truly big men on campus. Both these guys are lanky, skinny, still developing, skilled scorers. Hunter more so than his counterpart junior, Prince. R.J. Hunter’s scoring his dropped slightly in his junior campaign, yet he still averages nearly 20. Prince averages 14 but has been coming on stronger as of late. Each of these guys are about 6’7″ and don’t seek-out physical contact. That’s especially the case with R.J. Hunter. The best comparison for him is a combination of Reggie Miller and Steph Curry. Hunter is great in catch-and-shoot situations off of ball screens. Prince’s strength is more on getting rebound and turning it into a fast-break. I’m sure NBA scouts are interested in how these guys perform against each other. I can imagine a road for Prince similar to Tyrus Thomas of LSU a few years ago. He wasn’t in the discussion as an NBA First Rounder before the tournament. However, once scouts see his length and athleticism, they’ll try and figure out a position for him later. Looney is linguine to Kennedy’s lasagna. Looney’s length goes on for days. His wingspan allows him to scoop up any rebound on the plate. He averages almost 10 rebounds a game (yes, a double double is the norm for this freshman). Kennedy is like Lasagna. As a junior he’s more complex, there are more layers to his game and, yes, he brings the beef at 245 lbs. I’d imagine these guys would be paired up against one another at the power and/or small forward spot for durations of this game. For SMU to win, I’d like to see Kennedy stay out of foul trouble and use that massive frame to box out guys like Looney. Kennedy has only fouled out of one game this season, but spent the first quarter of it on the sidelines and also registered multiple games in foul trouble (4 personals, to be exact). I would not be surprised to see the X Factor for who will win this matchup come down to who is more successful in the midrange game: linguine or lasagna? Marky Mark vs. Warren G.
Coastal Carolina maybe the best 16 seed I’ve seen in my lifetime. Warren Gillis and the Chanticleers have been here before. Bronson Koenig is a sophomore and has only recently had the meteoric rise to tour so many shows in the absence of point guard Traevon Jackson. If Coastal Carolina is competitive, Warren G. will have to drop a few beats and make Koenig dance on defense. Jones is a thick Junior with a Mark West type of compass on the basketball court. He uses his “center of gravity” to get where he wants to go. He’s the bulldog on the block used to eating what he likes when he wants. Myles Turner is the new puppy on the street. We’ve all already seen his photo on our Facebook pages. Though Jones may play a position shorter than Turner, the freshman will inevitably challenge a lot of Jones’s activity at the rim. Kemba Walker’s step-back against Kawaii Leonard’s San Diego State squad in 2011. UNC’s Ademola Okulaja was on Harold “The Show” Arceneaux late, yet Weber State’s Cinderella story of 1999 would not be denied. Jacob Pullen and Shelvin Mack traded blows in a 2010 classic brawl between the Butler Bulldogs and Kansas State Wildcats. Who is your choice for a memorable matchup in this tournament? Tweet me @CBBEyeTest or leave a comment on the blog. It’s an annual tradition of about ten years. This entry was posted in Game Preview and tagged Justin Moss Devin Williams, Kevon Looney, Taurean Prince, Yogi Ferrell Fred Van Vleet by College Basketball Eye Test. Bookmark the permalink.